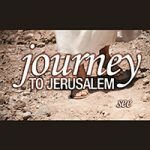 As Jesus nears Jerusalem, he encounters two men at the ancient city of Jericho. There we learn that hearts can be changed and lives turned around. Jesus can give a new start and a new beginning. But you have to put yourself in a position to see.